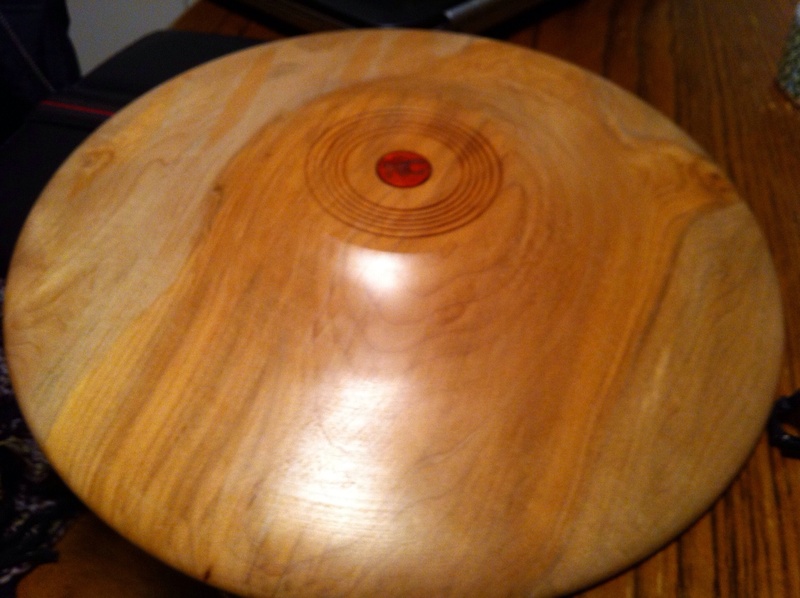 WoodturnersGuild.com • View topic - Labeling Bowls with an Emblem - How do YOU do this? Labeling Bowls with an Emblem - How do YOU do this? Of course, there are books, magazines, and there is information on the web; and there is the face-to-face Woodturners Guild of North Carolina monthly meeting; and there are workshops. And likely many other resources that I do not know yet. But I wonder whether it might be nice, interesting and helpful to hear from people on the Forum how they do things. I wonder how other wood workers label their bowls. What solutions have they found? When I started woodturning this year (2014) I thought it would be nice to label my pieces with the name of the wood, its geographical origin, the date (year) in which I made it, and my name. 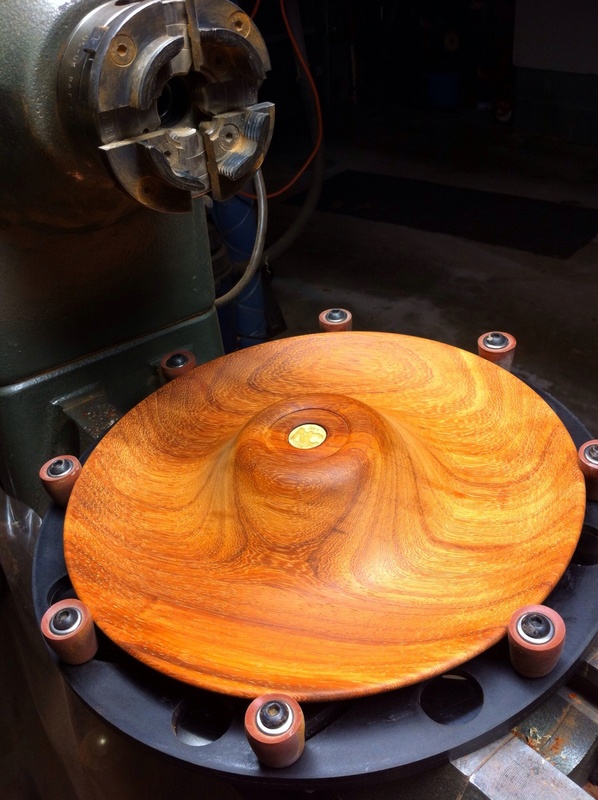 I was incredibly fortunate to meet, just when I started woodturning, an established woodworker in my neighborhood. He had recently bought a laser printer for his hobby that had turned into a part-business; an “Epilogue Fusion Laser” - https://www.epiloglaser.com/products/fu ... eries.htm; an expensive laser of > $ 22,000 (http://www.peppm.org/Products/epiloglaser/price.pdf). We created together on the computer an emblem for engraving – photos below. It is 1.9 cm (0.74 inches) in diameter. The engraving on the laser printer via a computer screen is easy and fast, as is the changing of the text for a next bowl. I am VERY happy with the accurate, professional quality of the emblem. We have made an arrangement that he engraves my wood pieces, whenever I have accumulated 5-10 of them; and we agreed on a payment of $3.00 per engraving. The set-up is almost perfect for me. The only thing I wish was different is that I had direct access to the laser printing myself, so that I could engrave myself - such as when a piece I want to give away as a gift needs engraving on short notice. It would be great - for anybody's sake, by particularly for the newcomer to woodworking - to hear/read what others do. How do YOU label your bowls? What techniques (pen, heat pen, etc. ), inexpensive or expensive, easy or complicated, are working for you and are you happy with? Thank you very much. Re: Labeling Bowls with an Emblem - How do YOU do this? Sadly, there used to be a place in Raleigh called TechShop where a monthly membership fee gave you access to a laser cutter, CNC router, and full metal and woodshops. They closed down here a little over a year ago, though the company has been opening new shops around the country like crazy. Your agreement sounds very workable. When I had access, it was still a bit inconvenient to laser every piece so for a time, I burned a set of 1/8 thick hardwoods with the year and my emblem/logo. This did not allow for naming the wood etc, but allowed me to easily turn a small recess and embed a customized logo on the fly. You might consider that for a backup, with a small set of light and dark wood discs already etched with the year and your name -- I did them at various diameters to use as needed. You could then use an indelible ink marker pen to note the wood in addition, or learn to use a woodburning tool and do it by hand as many turners do. Similarly, for about a $120 fee you can design and order a branding iron from Woodcraft or Klingspore that would allow dating and, well, branding, but not custom naming of the wood. Hope that helps. Others would have more to offer if and when they join this forum. I usually burn a serial number (YY/MM/Piece # from that month, ex: 150109, 2015-January-9th piece from month) on the bottom along with my name. Nice deal with the laser burner though!